I was about to board the bus from across my house to the MRT station, as usual la, going to work. Then somehow I slipped on the bus steps as I went in and my right leg bumped the steps. At first I thought it was just those normal bump where the result would be those blue-ish bump. 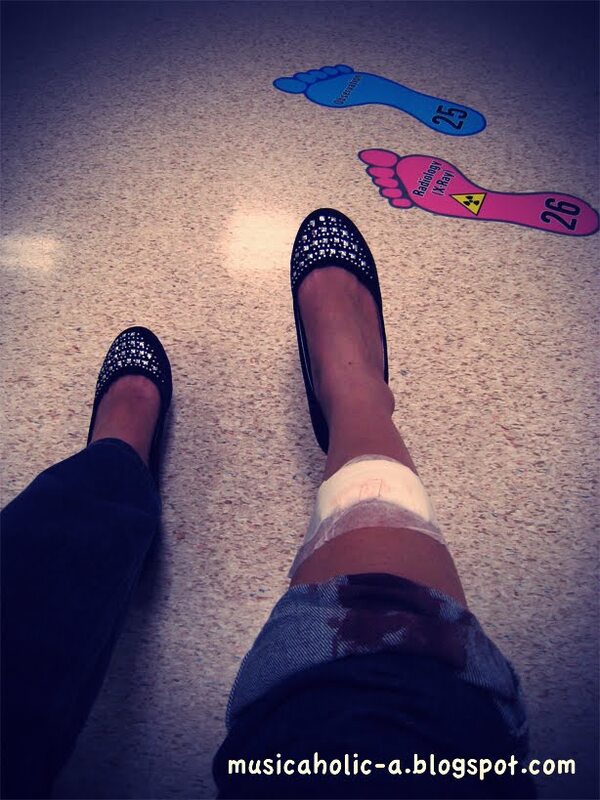 So I sat down, and a minute later I saw a small red circle of blood from on my right feet. I was still thinking that it was just a small cut and bleed a little. Unfortunately, I forgotten to bring tissue today and so I need to dig up my wallet for receipt and use it to wipe the blood temporarily. Then I rushed to 7-11 at Bishan station to buy tissue and wiped the blood which now started to flow like nobody’s business it wets my shoe. I still boarded the MRT, and after I’ve reached my destination, I sat down for a while and realized that the blood was still flowing happily. In horror, I rushed to the 7-11 there to buy bandages. I went to the toilet, pull up my pants only to see a wound that is quite big in diameter and deep. I thought to myself “Sh*t!! This is serious! And there was this young woman who came up to me and asked “Are you okay? I saw you bleeding just now” and I could see that she was really worried. All I can do was smile and say “I’m okay, it’s okay”. She took out a plaster and offered me, but I kindly refused and told her that I had to go to the hospital instead. Waited for a few minutes, and finally got a cab, and rushed to KK hospital which is just nearby my opis. I told the cab driver to dropped me off at the emergency room but he dropped me at the children’s emergency ward -_- (note that KK is a Women and Children Hospital). So I asked a staff there to lead me the way to the Women’s emergency ward. As I sat down in front of the nurse, I pull up my pants, and she looked at my wound in horror “OMG it’s so deep, it may need stitches”. The moment she said that, I swear I was afraid like hell!! I think she saw it on my face then she said “Need to see first la”. So one of the kind nurses there helped me to stop the bleeding and put bandage on it, and she advised me to go to Tan Tock Seng Hospital (which is nearby as well) instead because they will be able to give me a proper medication for this. Not that they can’t do it there, it’s just that they don’t have the specialist for that since they are a Women (specializing in obgyn and I forgot another one) Children’s Hospital. I decided to go to the opis for a while to tell Jessie that I might need to take an MC today. 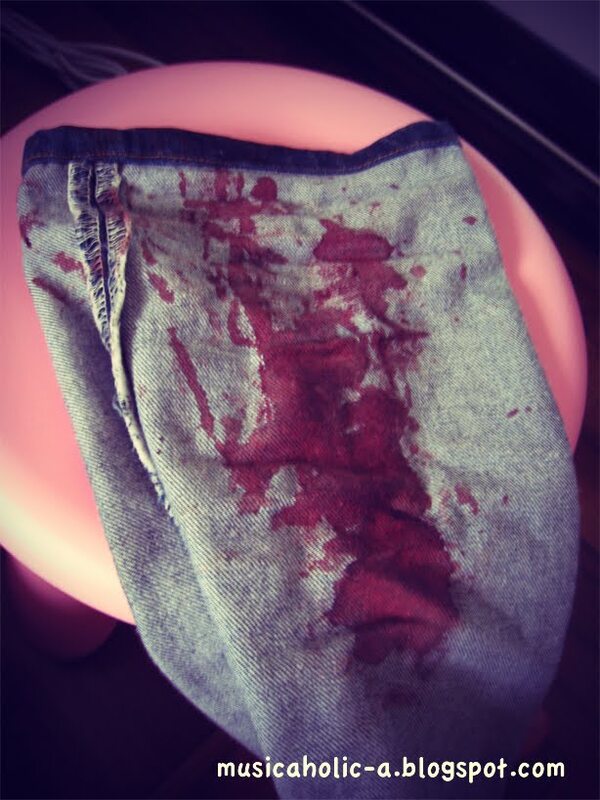 When she saw my jeans was soaked in blood, she told me to go to Tan Tock Seng that very second and lend me some cash as well since I only had $2 in my wallet. Gillian looked at me and rushed me to go quickly. Lol. Luckily I managed to get a cab fast enough. Soon I reached the hospital and went to the Emergency ward straight away. Waited for awhile, paid $85 (flat rate for everyone who came into the Emergency ward), then one of the nurse there finally called me and asked me several questions regarding what happened and all those standard questions they asked you when you are going for a check up la basically. And she needs to wear a blue paper bracelet. I told her that she looked more like the patient than I do. Lol. But I have no other option lo. So not long after that I was admitted to the Operating Theatre and there were 6 (yes, six) NUS Medical students who will be my audience during the stitching process. Lol it was kinda funny actually. I told them and the nurse that I was scared and they said that it will end fast, don’t worry. “We’re here to give you moral support”, one of them said that. Hahaha. So the nurse gave me a Tetanus jab to prevent infection and the doc explained bla bla bla to the students. Finally the stitching was about to begin It was fast. 15 minutes. Maybe it could be faster since the doctor was stitching and explaining to the med students. The anesthetic stings a little but there was no big deal about it. After that, my wound area was totally numb and I didn’t feel anything accept a slight cold feeling from the alcohol she used when she was cleaning my wound, and a feeling that my skin was being tighten. I got 4 stitches in total, and the thread was in blue color (blue-black)! Cool huh? Hopefully this will be my first and LAST stitches ever la. « Green tea latte boozes up my morning! 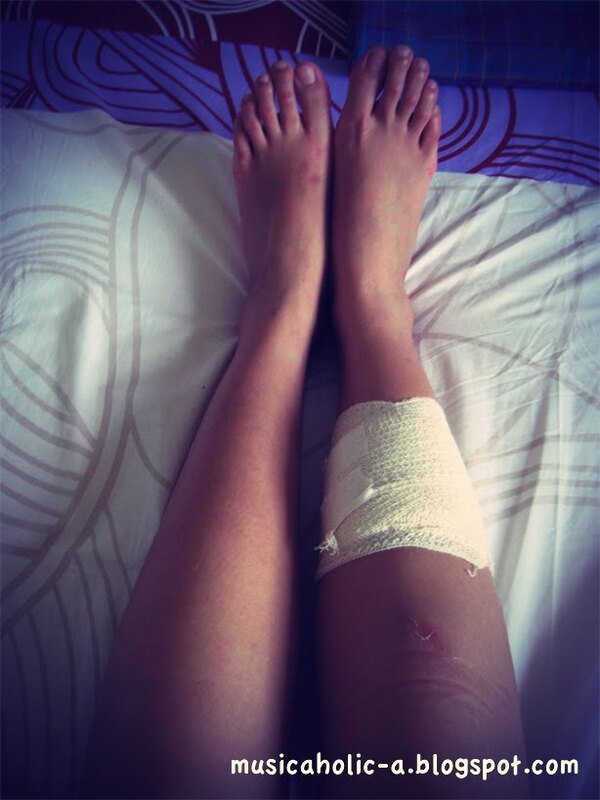 aduh cii.. bacanya ampe lemes sebadan.. 😦 how's ur leg right now? uaaaaaaaaaa… get well soonn..
OMG sista! !I applauded ur endurance to pain! You even walked here and there first! Man! If I were u I would run to the hospital as soon as the blood is flowing like crazy!For real yo! !u crazy!LOL!Hope now all is ok, eh? !